Congratulations to Meaghan Barr for being selected as a poster contest winner. 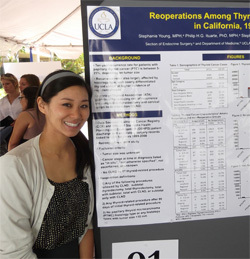 First year UCLA Medical students (from left): Stephanie Young, Stephanie Cham, and Amer Abdulla present their STTP projects at the 2012 Josiah Brown Poster Fair. Members of the UCLA Endocrine Surgery Research Group: Where are they now? We provide strong mentoring and career guidance. We are proud to say that 100% of our former full-time research trainees have gone on to secure the positions of their choice. 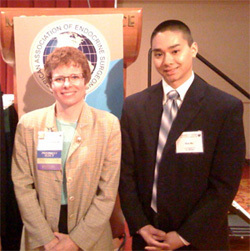 Bian Wu MS2 wins the American Association of Endocrine Surgeons best poster award (Madison, WI, 2008). Janice Pasieka, society president, is at left. Lilah F. Morris (resident, 2006-2011) – Endocrine surgery fellowship, MD Anderson Cancer Center, Houston TX. James E. Wiseman (resident, 2009-2011) – PGY4 position in general surgery, Methodist Hospital , Houston TX. Alexandra I. Stavrakis (medical student, 2006-2007) – Residency in orthopedic surgery, UCLA, Los Angeles CA. 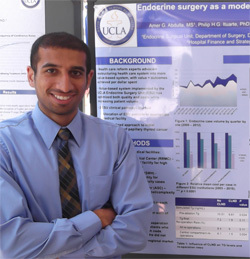 Rajan P. Kulkarni (medical student, 2007-2008) – Residency in dermatology, UCLA, Los Angeles CA. Andrew P. Dhanasopon (medical student, 2008-2009) – Residency in general surgery, Johns Hopkins Hospital , Baltimore MD. Matthew Mossanen (medical student, 2008-2009) – Residency in urology, University of Washington , Seattle WA. Roy S. Hwang (medical student, 2008-2009) – Residency in neurosurgery, West Virginia University , Morgantown WV. 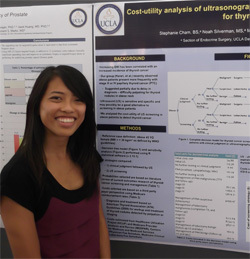 Bian Wu (medical student, 2008-2009) – Residency in general surgery, UCSF, San Francisco CA. Kevin Ro (undergraduate student, 2008-2010) – UCLA medical school, Los Angeles CA.